7:30 am: The school ground is nearly empty. Few juniors walking and chatting amongst themselves as school buses arrive with a bunch of hooligan students, shouting and screaming. 7:45 am: The ground now is no longer empty; seniors have their groups made, teasing and making fun of each other. 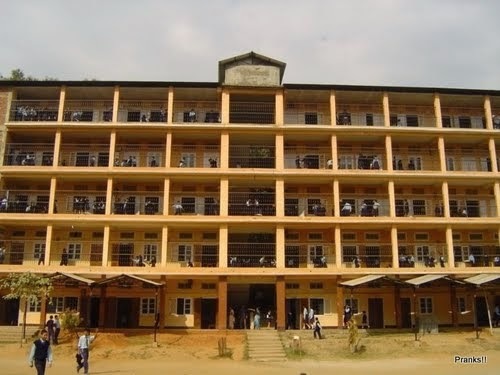 Juniors remain scared of the language monitors, of getting caught for not speaking English inside the school vicinity. 7:50 am: The microphone is brought out from the principle room by a staff boy, who is respected by all of us in equivalence to the teachers. 7:55 am: The first bell rings and all groups disperse to form parallel lines in a sequence, Class 1 A, 1B, 1C, Class 2A, 2B, 2C and so on till 10C. The longitudinal lines of each class would have girls first, shortest to tallest followed by boys in the similar sequence. Late comers would join at the end of the line along side uniform defaulters, right next to the teachers so as they could not run uncaught. 7:59 am: Semi final bell rings; there is absolute silence. Monitors go back to their individual class lines. Everyone has their hands folded, just their eyes open. All set for the prayer. 8:00 am: The final bell rings, all eyes shut, the prayer begins. Followed by the recitation of pledge and then the morning news and then followed by the thought for the day. If I am asked to list out what I liked the most about my school days, one of it would definitely be the routine described above. To put in a very simple way, we all call this the Morning Assembly. But the reason behind me, explaining it so elaborately is to highlight the significance of discipline which at least my school paid heed to. My passion for journalism and news also was encouraged by this morning assembly because of the news reading practice that we used to have back in our school. This probably contributes to a large fraction of my liking towards Morning Assemblies. But this post is not about why I like Morning Assemblies; it’s about something that defines a lot of things once you move out of school, into college and settle with a job. It’s about the culture that is embedded in you, only once in a lifetime, during your school days. We always talk about teachers being the driving force behind what and where you are today. But what we often fail to acknowledge is the contribution of the institution as a whole when it comes to building a personality, which you boast of today. A school embarks a culture into you. It inculcates values and a routine into you, which defines the life which you later chose to live. For example, having a very strict and morning assembly taught me to be on time for any event. Be it an exam, class or a movie, today if I am late for something I carry guilt of not being there on time. Why do I have this guilt? It’s because being late for school assemblies was considered a taboo for us back in school and being punished for the same was a matter of deep shame for everyone in the school, including the most hooligan students. Almost entire of our school time we complained about how strict our school management was. But never have we given a thought about how this strict model has shaped our life. How you respect your teachers to how deal with teachers? Everything is dictated by your early school days. Not stretching things long, the whole point here is to highlight the role of an institution when it comes to culturing a student. On the occasion of Teacher’s Day, let’s just acknowledge significance of the institution (school) as a whole in shaping our future and for giving us a direction in life.